Jump start your U.S. Proof Set collection! Add every set from 1984 to 1993 - all in their original purple packaging! It was 1984. Prince's Purple Rain was topping the charts and his movie of the same name was packing theaters around the country. That same year, U.S. Proof Set collectors were shocked when they opened their mail from the mint - out of the blue, the official government packaging had changed to purple! Coincidence? Or was someone at the mint a fan of the "Minneapolis Sound? " We'll never know - but we DO know that all U.S. Proof sets for the next 10 years were packaged in the same color! 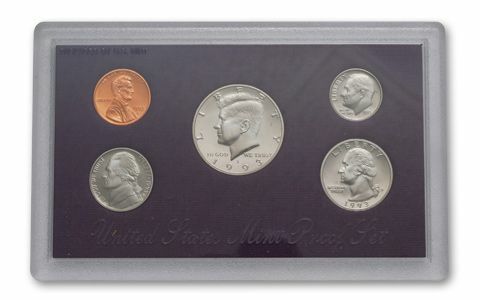 1986 - Just 2,411,180 sets were produced in '86, making this one of the lowest mintages of all modern Proof Sets! 1987 - This is the ONLY way to get an '87 Kennedy Half Dollar, since the mint didn't strike ANY for circulation! 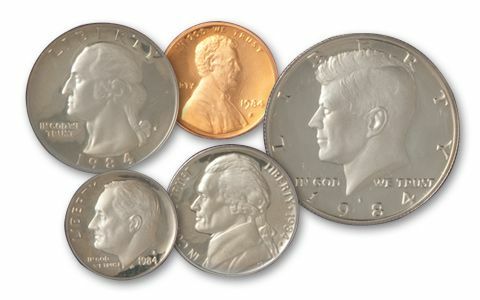 Add the 1984 set with a penny in good condition (most you'll find are extremely corroded), and this 10-year collection is a smart buy at almost any price - particularly when you consider the high dollar amounts some of these coins have commanded in the past! 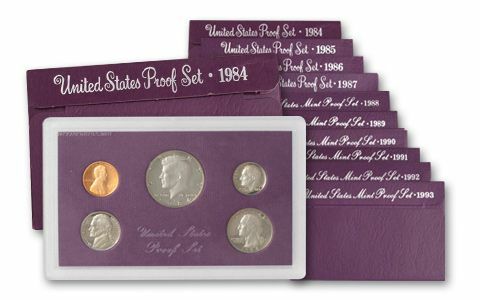 Buying each of these Proof sets individually could cost you as much as $137 - nearly DOUBLE our price! Or you can own the entire 10-year, 50-coin collection for only $1.40 a coin! Don't wait to order yours!